Oh no, Krypto™ has been captured by Lena Luthor™! She’s taken him to her hidden lab by the harbor to drain his super powers and make evil little Kryptomites. Race to the factory with Supergirl™ to rescue Krypto and put a stop to Lena’s plans. Watch out, that blue confused Kryptomite™ is shooting at you from the roof while Lena Luthor escapes with the new Kryptomites. Catch her before she gets away! Price is 39% below the initial Lego retail price, a € 27.49 discount! This comes down to 9.84 cent per brick. The Lena Luthor™ Kryptomite™ Factory (41238) Lego set is available from the sites below. However, they do not offer delivery to your selected region. The Lena Luthor™ Kryptomite™ Factory (41238) Lego set is no longer directly available from the sites below. However, 3rd party partners of these sites might still have the set available. Alternate description Stop Lena Luthor™ from making evil little Kryptomites! Includes Supergirl™ and Lena Luthor™ mini-doll figures, plus Krypto™ the dog and 3 Kryptomite™ figures: green, purple and blue. Features a 3-level factory with a lab, holding cell, crystal element, Kryptomite™ dispenser/slide, ‘power drain’ room, break-out door with graffiti and a Kryptomite shooter. 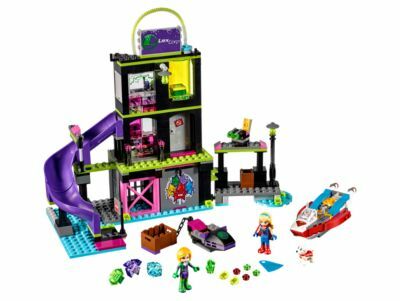 Also includes Lena Luthor’s getaway boat with a chain and box for the Kryptomites, and Supergirl’s jet boat with dual shooters and room for Krypto™. Lift the lever to send the ‘finished’ Kryptomite™ down the slide and into the box. Push the button on the rooftop shooter to fire elements at Supergirl’s jet boat. Push the door to help Lena Luthor™ break out and escape in her getaway boat. Connect with 41237 Batgirl™ Secret Bunker via the zipline system to expand your Super Hero play! Cute but evil Kryptomites are included in every LEGO® DC Super Hero Girls™ set. Lena Luthor™ Kryptomite™ Factory measures over 8” (22cm) high, 2” (6cm) wide and 11” (29cm) deep. Supergirl’s jet boat measures over 1” (3cm) high, 4” (11cm) long and 1” (5cm) wide. Lena Luthor’s getaway boat measures over 2” (6cm) long, 1” (4cm) wide and under 1” (2cm) high.